Purpose: Use this document as a reference for how to run the pay calculation process in ctcLink. 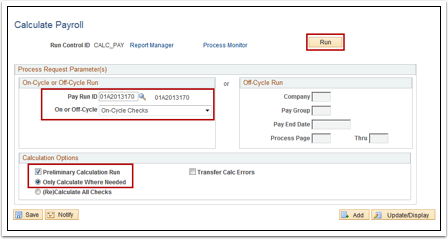 Click the On or Off Cycle drop-down menu and select On-Cycle Checks. Click the Preliminary Calculation Run checkbox. Click the (Re)Calculate All Checks radio button. Click the Refresh button until the Run Status is Success and the Distribution Status is N/A.